Improvisational comedy holds a very special place in my heart. I first got my taste of improvisation at the age of 13 when I started performing with my high school comedy troupe. We would have improvisational competitions against other high schools. Improvisation is the basis of everything for me. It’s the art of conversation. Life is improvisation. We definitely don’t plan out every interaction we experience with others. All of life is sort of fly by night much like an improv comedy show. The pinnacle of that experience is BATSU!. BATSU! means punishment. Which is the game here at BATSU!, a Japanese Gameshow. I have had the honor several times to experience BATSU! live. November 13th at 10pm I was shown once again what a strong group of improvisers I’ve had the opportunity to know. In 2006 I started performing for a small improvisational comedy group called Friday Night Face Off, Long Islands longest running improv show. Friday Night Face Off worked out of a underground theatre in Port Jefferson called Theatre Three, one of Long Islands most well respected theatrical institutions. It’s only apropos that they would continue that tradition at Jebon in an underground lounge. In the years to come that small improv group grew into a company in Astoria called Face Off Unlimited or FOU. FOU started offering classes. Those classes slowly grew into several shows in Manhattan and Queens and has even extended it’s arm to Chicago. One of those shows was BATSU!. A Japanese Gameshow that pits four improvisers against each other. 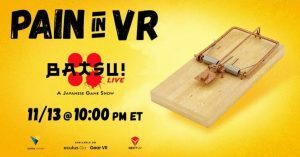 Whomever loses those competitions must endure BATSU! or punishment. If the audience finds you were unfunny they choose for a player to endure various punishments from, rat traps on the hands, to eating large chunks of wasabi and a shock collar on the players as a final coup de gras. That’s only a few examples of how, punishment is the game. BATSU! has been playing at Jebon The Japanese Restaurant located on St Marks Place in the heart Manhattan for several years now. Batsu also plays in Chicago at the lounge at Kamehachi, Chicago’s very famous sushi bar at 1531 N Wells St, Chicago Il. Face Off Unlimited’s ability to constantly grow and keep their eye on what the future of comedy is, is undeniable. FOU has now produced BATSU! as a Virtual Reality production for those abroad. Partnered with Oculus and Next VR, the tops when it comes to Virtual Reality. One can now wear Virtual Reality goggles and experience a live show that is nowhere near you. I love the idea that I could literally be walking the streets of Brooklyn and watch a live show in Virtual Reality in Austrailia. Tonight we had some of New York’s finest improvisers for this very special event, that will change the face of comedy forever. Joe Tex, Jay Painter, Whit Baldwin and Nicholas Sotack without a doubt brought the laughs as could be seen through the constant state of hysterics the audience was in. Brian Walters seamlessly hosts this great production with Noriko Sato who doles out each torture with a wily smile on her face. In addition the hard work and dedication put forth by Chihiro Cute-Beat as BATSU! Ballerina, Brian Esposito as BATSU! Baby, Josh Goergen as Jaquo (body sushi model), Paris Kylil as BATSU! Ninja and Chrissie Kahler as Sound Warrior does not go unnoticed and helps pulls together a great night, they add a great traditional piece to the production. From beginning to end the audience was right there with them. BATSU! is the perfect date. Especially if you’re trying to tell your date you like pain. BATSU! is shown at Jebon throughout the week, make reservations by going to the website below. I promise you will not be unsatisified.